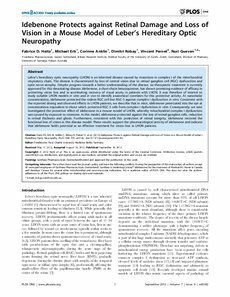 Abstract Leber’s hereditary optic neuropathy (LHON) is an inherited disease caused by mutations in complex I of the mitochondrial respiratory chain. The disease is characterized by loss of central vision due to retinal ganglion cell (RGC) dysfunction and optic nerve atrophy. Despite progress towards a better understanding of the disease, no therapeutic treatment is currently approved for this devastating disease. Idebenone, a short-chain benzoquinone, has shown promising evidence of efficacy in protecting vision loss and in accelerating recovery of visual acuity in patients with LHON. It was therefore of interest to study suitable LHON models in vitro and in vivo to identify anatomical correlates for this protective activity. At nanomolar concentrations, idebenone protected the rodent RGC cell line RGC-5 against complex I dysfunction in vitro. Consistent with the reported dosing and observed effects in LHON patients, we describe that in mice, idebenone penetrated into the eye at concentrations equivalent to those which protected RGC-5 cells from complex I dysfunction in vitro. Consequently, we next investigated the protective effect of idebenone in a mouse model of LHON, whereby mitochondrial complex I dysfunction was caused by exposure to rotenone. In this model, idebenone protected against the loss of retinal ganglion cells, reduction in retinal thickness and gliosis. Furthermore, consistent with this protection of retinal integrity, idebenone restored the functional loss of vision in this disease model. These results support the pharmacological activity of idebenone and indicate that idebenone holds potential as an effective treatment for vision loss in LHON patients.